If you have been reading this blog for a long time you might recall a post or two in which Mr IronFingers and I went out nettle picking. If I pick nettles I have to wear two pairs of gloves and make a huge song and dance about it. If the bag so much as brushes against my skin once it has nettles in it, I scream – just in case – a bit like the White Queen in Alice in Wonderland. If a nettle looks at me, I quiver abjectly. Mr IronFingers on the other hand laughs at nettles and grasps them firmly and then pops them in the bag. He who is hopelessly allergic to all berry fruit and their little tiny hairs does not react to nettles at all, how strange is that? This entry was posted in Bread, Dog Walks, Food, Wild Food and tagged Carl Legge, Nettle and Wild Garlic Pizza, The Guardian, The Permaculture Kitchen on 18/04/2014 by Joanna. I am a bad blogger, I have half-written posts whirling about in my head and none of them finished. I take photos of things with great bloggerly enthusiasm and then somehow the moment passes and I think you probably don’t want to see or hear about old stuff from the week before or even last month. Is blogging supposed to be in the here and now, is it ok to backdate one’s blog life diary, even relate stories out of synch? How do you feel about this if you blog? How related to a personal timeline should a blog be? Would you as reader mind seeing photos of flowers that have now passed on to the great seed pod in the sky? On a completely random note, I have just waded my way through the first of a two-parter on time travel set in the London Blitz by Connie Willis, called ‘Blackout’ and debating whether to read the second part; truth is I haven’t really engaged with the characters, maybe they will get more interesting if I wade through the second chunk of this. The only thing I really want to know is whether they have to stay put in the 1940s or get back home; I always prefer it when people get back home in time travel stories. I really liked an earlier story called’ Firewatch’ and her ‘Doomesday Book’ novel, which are all part of the same series, which is why I bought these two. If you like time travel stories by the way, my favourite is one called ‘The Book of Kells’ by R A MacAvoy. I read the Connie Willis books because a friend of mine who is now dead, was a great fan of hers and so I read them for her and imagine the conversations we might have had about them once we had both read them. We all have our own ways of remembering friends who are gone and this is what I do to comfort myself for the loss of this friend. One thing I do know is that the book has given me nightmares of cities built out of red sandstone where the streets and buildings fall into holes in the ground and one can never find one’s way back to where one was, just keep on going and hope that somewhere, some place it makes sense. I know that this dream is in part derived from some of the passages in the book, but there are no bombs in my dreams, just huge clouds of red dust and buildings silently sliding into crevasses, of running up and down staircases, through courtyards, along passageways and corridors, pushing doors open and always looking for the people I have lost, out on the street, through a building here, round the crest of a hill there, I am exhausted when I wake up. Nightmares have a way of making waking reality preferable most of the time. I made this rather wonderful choc chip Victoria Sandwich cake last night and it was too late to eat it by the time I finally did the icing thing so I have decided that today I can have yesterday’s slice as well. Flawless logic as ever. →The recipe is by Dan Lepard ← and can be found on the Guardian’s website for Friday 21st June. I have been thinking about chocolate cake for a while now and how most chocolate cakes these days are squishy and dessert like which is great but sometimes I just hanker after a cake that is not made of pure chocolate, butter, eggs but has flour in it, the sort of cake you can carry off on a plate to a chair somewhere and eat without feeling you have just consumed a box of artisan chocolates that were very nice but you wish you had only eaten two of them. This cake is, as promised by Dan in the recipe, chocolatey but not overwhelming. It is light and moist with a slight tendency to crumbliness, which I like. After all there is nothing quite like chasing cake crumbs around a plate either decorously with a fork or more prosaically with a damp finger. I used a few bowls in the making ; there was a worrisome moment on mixing in the cocoa batter into the creamed butter and sugar as it looked a bit weird but after that it all came together and I am more than happy with the result. If I were to open my garden for National Garden Day this is the sort of chocolate cake I would make for my visitors, in fact I would be happy to make it for anyone who came for tea. I used four large duck eggs and half and half light brown and dark brown soft sugar as I didn’t have enough of either, Green and Black’s cocoa, and some Lindt dark cooking chocolate and a rather expensive tube of Waitrose own brand chocolate chips. …excuse me, I have cut this slice and am terribly sorry but I have to go and eat it before the mouse carries it away. Life is very hard sometimes. This entry was posted in Blogging, Cakes, Chocolate and tagged blogging, cake, chocolate chip cake, Connie Willis, Dan Lepard, nightmares, The Guardian, Victoria Sandwich Chocolate Cake on 23/06/2013 by Joanna. P is for Plums, Poodles, Peas, Pancakes, Potatoes, Pumpkins, Potager, Present and Past, Possibilities, Principles, Palaver, Print, Plumpness and Poetry. I think I’m going to plump for Plums! I love them you see, particularly English ones, like early Victorias with their yellow and pink speckled skins and their greenish insides, little wild mirabelles gathered from ornamentals in the park, or just plucked from a tree branch overhanging the street, eaten fresh as they are, or in a plum sorbet, or baked in a crumble, as a cake topping, ruby jam liquifying on a buttery crumpet in the middle of winter, or spicy in a chutney with roast potatoes…. This entry was posted in Alphabet in August, Cakes, Sweet Stuff and tagged Dan Lepard, How to Bake, plum tart with sherry cream, plums, The Guardian on 18/08/2011 by Joanna. Was a bit flummoxed about getting the softish dough onto the tray, but realised that the best thing was to roll the dough out on to the paper to start with, then pick the paper up together with the dough and plop it on the tray. I also made a bit of a mess of marking and scoring the bread but it mattered not a bit. Every last one was eaten and enjoyed by all accounts! Soft white baps and semolina buns on the way to the party..
We had some very fine Italian spicy sausages full of fennel seeds and chile with ours. If you don’t know it, Dan Lepard writes a great baking column each week in the Guardian newspaper, usually with ingredients that are easily available and fairly straightforward techniques for the home baker to follow. Celia has made these and partnered them with some fabulous burgers in chilly Sydney. Have a look here! And here are Di’s, which look very professional indeed. And Ulrike’s very smart buns. And C has made a loaf of it here, which I think is a smart move which would give you that lovely bread without all the hassle of shaping it into buns! I think Dan has created another winner here! They seem really popular with kids, here are Christine’s, look at that scoring! 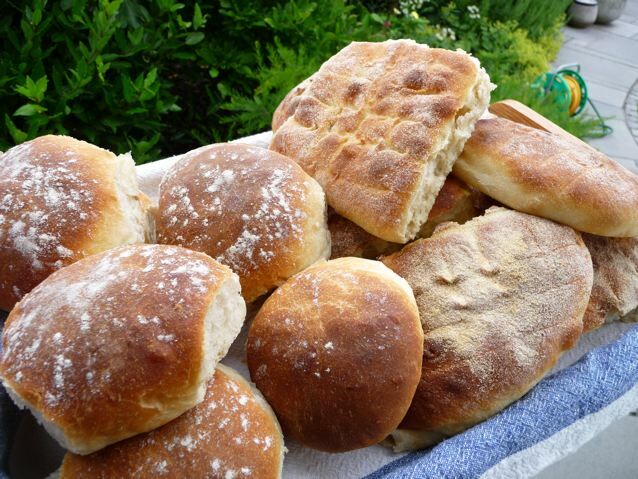 and here are Heidiannie‘s too being enjoyed by her family and every time I see them I feel hungry all over again and think about making another batch…. oh look I did… Click here! 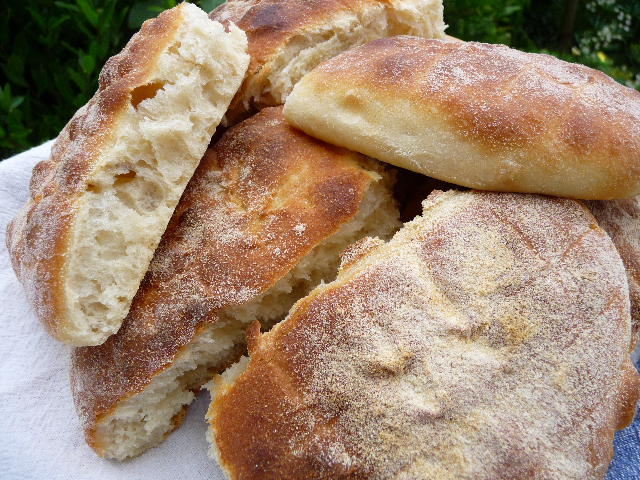 This entry was posted in Bread, Buns, Recipes and tagged barbecue bread, best barbecue buns, Bread, Dan Lepard, How to Bake, semolina BBQ buns, soft white baps, The Guardian on 24/07/2010 by Joanna.